Also known as cropping, the primary purpose of scrapbooking is to preserve memories for future generations, but a secondary purpose often is to exercise your creativity as you display your memories in a scrapbook. Scrapbooking as a hobby has been around since the 15th and 16th centuries. In its early stages, scrapbooking was simply a collection contained in a book. These collections could include recipes, greeting cards, snippets of paper memorabilia, tickets, or playbills. In the 1980s, scrapbooking as we know it today started as an off-shoot of the Mormon's desire to preserve their family and religious history. As the idea spread, it reached a mass audience of home photographers who wished to record and preserve their families' memories for the future. Marielen W. Christensen of Elk Ridge, Utah is the woman credited with modernizing scrapbooking. She is the author of Keeping Memories Alive and opened a scrapbook store in Spanish Fork, Utah in 1981. The hobby became especially popular from 2001 to 2005, and it was a $2.5 billion industry with over 1,600 companies creating scrapbooking products by 2003. The rise of bloggers has likely helped it grow in popularity, and digital scrapbooking is also popular, allowing people to both share online and print hard copies. Scrapbooking is popular because it lets people document their families' lives and socialize with others while crafting. There are even gift books to do so—Project Life is a system offers a quicker, simpler way to document activities and milestones and involves binders with a variety of pages (some paper, some photo sleeves and other adornments that go with them). More than 4 million women in the United States are said to be scrapbookers. Other crafts and hobbies have worked their way under the scrapbooking umbrella, such as using decorative planners and adult coloring. There has also been a rise in trade shows dedicated to scrapbooking such as the Stamp and Scrapbook EXPO and Craft and Hobby Association (CHA). Basic supplies for scrapbooking include a scrapbook (sizes vary but the traditional ones are 12 inches by 12 inches square). 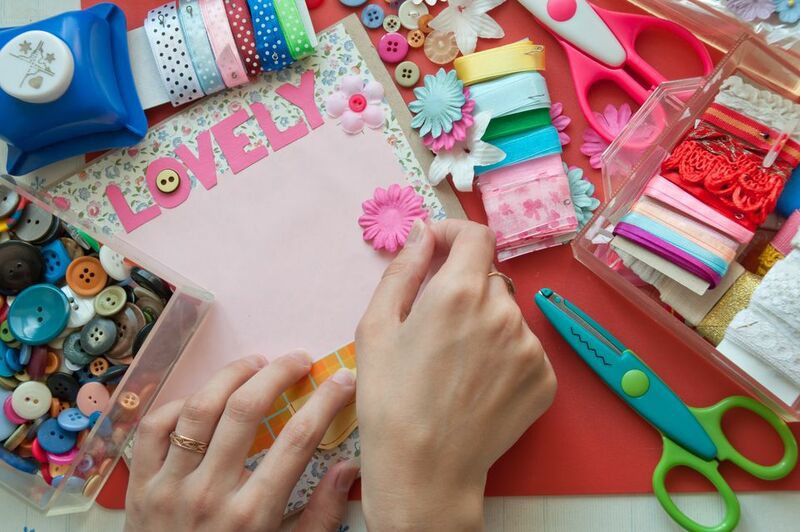 Scissors, decorative papers, glues, stickers, and other embellishments can also be used to create one-of-a-kind scrapbook pages along with special pens and markers to add handwritten notes. Most craft stores have a space dedicated to scrapbooking supplies.